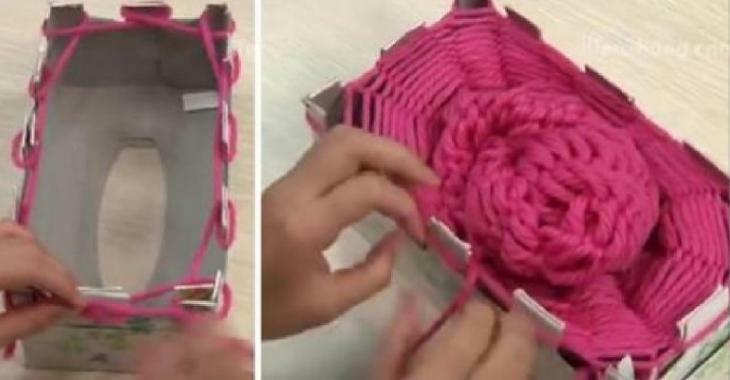 Crafts : What she does with a box of tissues will change the way you knit ... It's magic! What she does with a box of tissues will change the way you knit ... It's magic! In no time, a scarf ready to wear! The evenings are about to cool off and very soon you will need a cozy scarf to protect you from the cold. If you have always dreamed of knitting one but have never had the patience or skills to start a project of this kind, we offer you an easy knitting method without needles. Yes, it's true! With two boxes of tissues, you will be able to make a beautiful fashion scarf that will make some envious. 1. Cut the bottom of your 2 boxes. On one of them, cut the two edges on one of the short sides, which will create an opening (please see the picture). 2. Place the box with the cut-out side inside the other - Make 3 cm cuts all around the box at equal distance. We recommend that you make landmarks with a ruler. 3. Remove one rectangle on two with your scissors (please look at the image), taking care to leave each corner intact (the box will look like a medieval castle tower :). 4. With adhesive tape, attach your yarn to one of the corners. 5. Wrap the yarn around each peak through the inside of the peaks until you have completed one full turn. 7. Repeat the exercise several times until the desired length is achieved. Quietly, your masterpiece will take shape. 8. Once the scarf is completed, tie a knot to secure everything but do not cut the thread right away - Pull the scarf through the bottom hole. 9. Take the rest of the wool into your hands and insert it, starting from the bottom, into each of the loops around the peaks going through the outside. Then tighten everything and make a knot to secure (for the visual, click on the tutorial at 3min35 sec). To view the step-by-step method, you can watch the video below. * Even if the video is not in English, you will be able to understand the method by following the steps.